Lake Kaniere is located about 19.7 kilometres east of Hokitika and is considered one of the best lakes for water sports in the region due to the close vicinity to the State Highway and the placid nature of the lake. It is surrounded on three sides by towering mountains which are covered in snow in the winter while native bush grows right down to the shore of the lake. Sunny Bight and Hans Bay on the shore of the lake are populated by holiday homes, many of which are available to be rented, and some permanent residences. 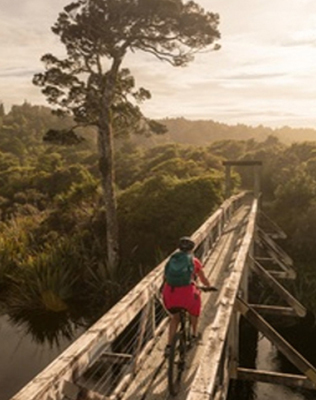 The lake is the source of the Hokitika water supply while the Kaniere water race, measuring approximately 11 kilometres in distance, which carries water to the small power station located closer to town, is very popular with mountain bikers and trampers. Another popular walking track starts at Sunny Bight and takes trampers about half way around the lake.